A Loose Bobbin: Reveal day! So I've been busy working diligently in getting my Tangled Textile challenge completed. So here it is. It began with a piece of bleached muslin and some fabric paints. First I brushed plain water over the entire piece, I was told that this would make it easier to blend the paint. I painted white in the lower third and blue in the upper third. In the middle third, I mixed a small amount of blue with the white, added a bit of water and blended in the colour creating a wash-like effect. After it dried, I sponged additional white over the blue to paint in the clouds. 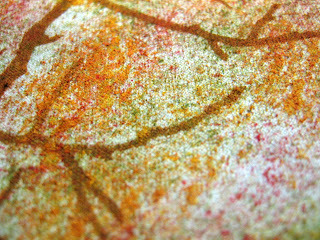 For texture I wanted to incorporate needle felting, but had no idea how to go about it. I spoke to my friend, Bonnie, who was familiar with needle felting and she provided a sample. She had needle felted white roving to a very pale blue netting. It looked like this. 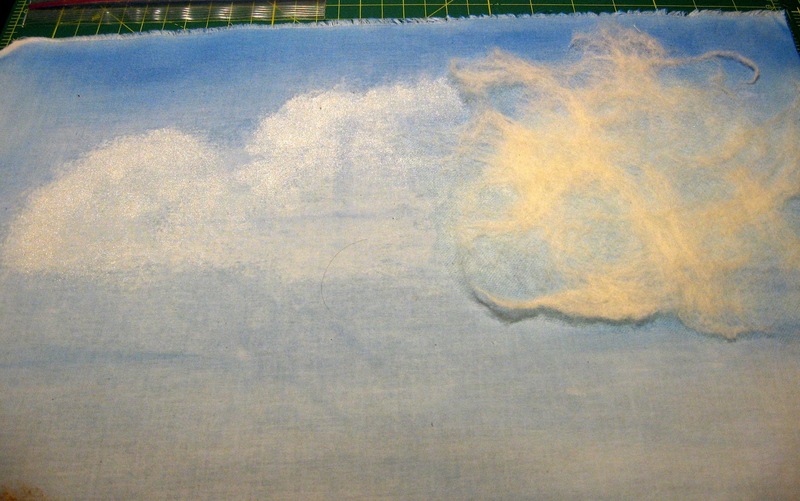 After sewing it to the painted background, it produced the fluffiness I was hoping for in some of the clouds and looked like this. Then I needed to get the perspective right and add something that would give the impression of height. That's when I added the treetops with a stencil and shiva paintstiks. 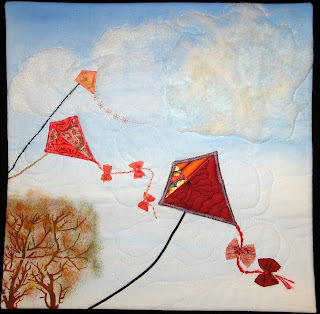 I initially pinned the kites and their tails in place to see how they would fit and if the scale was right. I was concerned about how I would quilt the piece so I decided that I would do some free motion quilting first. 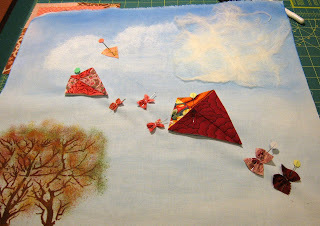 After outlining the clouds and adding some swirls for the wind, the kites were repinned in place. I couched the kite tow-lines (is that what they're called?) and embroidered the tails in place. All that was left was to bind the quilt﻿ but I didn't want to detract from the picture so I made my first attempt at facing the quilt. I used the tutorial on Susan Bruebaker Knapp's site. It was one of the best illustrated ones I've seen. Another challenge completed. Now, on to creating some more projects, maybe some more doodling or FMQ. fabulous Brigitte! Your sky is just perfect, and Bonnie's cloud adds just the right touch. I love how the kits appear ti be dancing in the breeze. Thanks for sharing more of your methods in creating this fun quilt. Congratulations on adding to your techniques toolbox! I hope to add a few new ones this year. Love the kites! All the texture is wonderful.